As an exciting Black Friday shopping weekend approaches, consumers are ready to be the first in line to grab fantastic bargains. Business owners who launch a Black Friday email marketing campaign are in a prime position to cater to passionate spenders looking for great deals. The National Retail Federation reported that 174 million shoppers took advantage of Black Friday weekend last year, and that number is expected to rise this year. Consider these six expert ideas to make the most out of your email campaign this Black Friday. To generate the most sales revenue during Black Friday weekend, attract as many consumers as possible by getting them to subscribe early. Create a crisp sales page that showcases your current deals and gives consumers a glimpse into your Black Friday shopping weekend promotions. That way, you can convince consumers to submit their emails now to gain access to exclusive deals later. The larger your subscriber base during Black Friday promotions, the greater the odds you have of breaking your former sales records. Marketing on various platforms before Black Friday is a brilliant way to get more subscribers to sign up. You can create sales funnels that connect to popular social media platforms and busy forums that lead back to your website. Organize your landing page so that it is easy for consumers to see where to enter their email address to gain access to exclusive Black Friday promotions. A captivating subject line can make clients want to open up your emails to discover what you have to offer. Forbes reports that the best email subject lines are short, engaging, and relevant to the point. Using the phrase “Black Friday” in the email subject line is important, so consumers seeking deals will know what to expect. Be sure to insert preview text to reach subscribers that may be scanning their inboxes everyday. Sending personalized emails can also give you an edge in the inbox. Using the name of the person in the subject line is one of the best ways that you can gain the attention of the subscriber. Remember to spell each recipient’s name properly in personalized emails, or they may be repelled by an email that was meant to please. You should verify the email address of every single subscriber. Email validation is used to verify whether or not an email exists and is valid before you send any promotions. Validating each email address also helps you to avoid loading disposable addresses into your subscriber database. Whether you’re sending emails to new subscribers or writing to an old email list, email verification can help you send out your Black Friday email promotions confidently and avoid bounced emails. A bulk email checker tool can help you swiftly identify valid addresses and eliminate addresses that are inactive or outdated in your database. Using a bulk email checker tool allows you to avoid sending email marketing campaigns to unresponsive email inboxes, and focus your efforts wisely. Using these tools before sending any email campaign is recommended to maximize your results. To ensure that your email promotions actually reach your subscribers, it is important to stay clear of spam filters. Internet Service Providers (ISPs) and Email Service Providers (ISPs) have intelligent systems designed to target emails that may contain spam content or suspicious links. Furthermore, you may be penalized if your email marketing campaigns are reported many times by an ISP or an ESP. To avoid alerting spam filters, you must carefully review the quality of every email sent through your campaign. Quick Sprout reports that using words like ‘clearance’,‘shopper’,‘buy direct’, and ‘order’ in eCommerce emails can easily trigger spam filters. Although a few product images can significantly influence shoppers to visit your website, avoid overloading your messages with images. Emails that take a long time to load are often closed early by subscribers, and they continue exploring their inbox. Many people may access their emails on a mobile device or limited internet connection, so messages should be mobile-optimized and must load quickly. There’s a lot of things you can do to make sure your email doesn’t land in the spam folder. If subscribers simply open your emails but take no action, it is not enough to generate sales revenue from the Black Friday shopping weekend. What you must do is encourage subscribers to take the next step and visit your website and explore your products. Mentioning a niche of compatible products to segments of your target audience is key. Segmenting your email list allows you to present the best set of products and deals for each set of subscribers. Integrating links for electronic coupons or promotion codes in the body of your email can influence subscribers to visit your website. Offering your hottest line of products at low prices can get many subscribers to take advantage of your Black Friday deals. A basic announcement email that offers subscribers 30, 40, or 50 percent off sitewide is also an excellent strategy to attract more sales. Offering customers a free gift with any purchase can also motivate them to explore your website for more valuable deals. Designing a great Black Friday email is also an excellent way to showcase your brand in a unique and positive light. Adding great copy that resonates with your brand’s mission and core values can help you transform Black Friday shoppers into long-term customers. Creating a sense of urgency can also encourage subscribers to take action right away on the promotion, Depending upon your brand and the context, you can consider using a bit of humor in your emails. Sending Black Friday emails at the wrong time can lead to subscribers visiting your site too early or too late for the sale. The timing of your email campaign can sometimes make or break your chances. Alerting subscribers a week before, a day before, and hours before the sale is a good strategy to stay fresh on their minds. Re-sending the email to subscribers who did not open it the first time can improve your odds of making sales. Consumers may be busy shopping online or offline, so you can gain an edge over competitors by extending your sale. While some companies may force customers to take advantage of 24-hour promotions, you can run your sale over the entire weekend. When consumers discover they missed out on some Black Friday Deals, they may be relieved to see your sale still going strong. After your competitors have shut the doors on the promotion, you can gain those sales they lost. 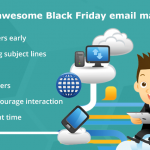 Here is an infographic about Black Friday email marketing ideas. Feel free to share it! Thanksgiving weekend is an excellent marketing opportunity to create new customers and delight the existing ones. Your email marketing campaign on Black Friday can be a hit or miss depending the quality of your emails and the allure of the promotions you offer. Planning your email marketing campaign well in advance can ensure greater success, so craft your messages early to persuade consumers to visit and buy. Consider doing a split test on subscribers to see which emails attract more people to open the message and visit your website. When you find out which emails work well, use them to increase conversions that transform to sales during Black Friday weekend. Is your email list safe to send emails? Boost your marketing performance by improving email deliverability and open rates. We protect your sender reputation by verifying your email lists. The better your reputation, the higher your deliverability. We filter out invalid and risky email addresses from your list. Clean your email list with 100 Free credits daily! © QuickEmailVerification. All rights reserved.